When listening to the illusion over headphones, most right-handers hear a melody corresponding to the higher tones as on the right and a melody corresponding to the lower tones as on the left. When the earphone positions are reversed, the higher tones continue to appear to be coming from the right and the lower tones from the left. 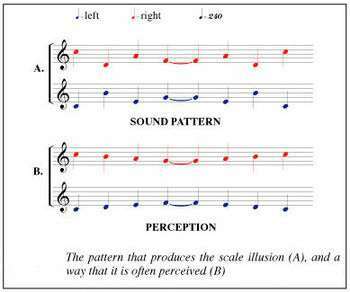 Other people experience different illusions, such as the higher tones on the left and the lower tones on the right, or a pattern in which the sounds appear to be localized in different and changing ways. Right-handers and left-handers differ statistically in how the scale illusion is perceived. In a clinical study, patients with unilateral neglect were shown to experience the scale illusion. Further, in an MEG study on normal listeners the scale illusion was found to be neurally represented at or near the auditory cortex. The above example, played first a channel at a time, then simultaneously. The full illusion, as originally developed by Deutsch, is linked below. Deutsch, D. (1975). "Musical Illusions". Scientific American. 233 (4): 92–104. doi:10.1038/scientificamerican1075-92. Deutsch, D. (1983). "Auditory illusions, handedness, and the spatial environment". Journal of the Audio Engineering Society. 31: 607–618. Radvansky GA, Hartmann WM, Rakerd B (1992). "Structural alterations of an ambiguous musical figure: the scale illusion revisited". Perception & Psychophysics. 52 (3): 256–62. doi:10.3758/bf03209143. PMID 1408637. ↑ Bregman, Albert (1994). Auditory Scene Analysis: The Perceptual Organization of Sound, p.76. ISBN 0-262-52195-4.